Suzie Tew made the most of the warm and sunny weather on Tuesday and took Sam George, Lisa Cook and Gaynor Lewis for a run to Trefil. 5 club members participated in the final SSAFA 5K race in Cardiff on Wednesday – Lee Aherne, Lauren Cooper, Stephen Mathers, Ian Kent and Jonathan Astley. Lee Aherne won the series overall for MV50 and received a shiny hip flask, yellow t-shirt less money than 2nd place! There were PBs to report for Stephen Mathers and Jonathan Astley. Organised by Phillip Miles, the 4th Annual Cardiac 6 took place on Thursday evening. The tough 6 mile race is in aid of the North Gwent Cardiac Rehabilitation and Aftercare charity and is well supported by members of the club. As such we’re always in with a good chance of winning some prizes. 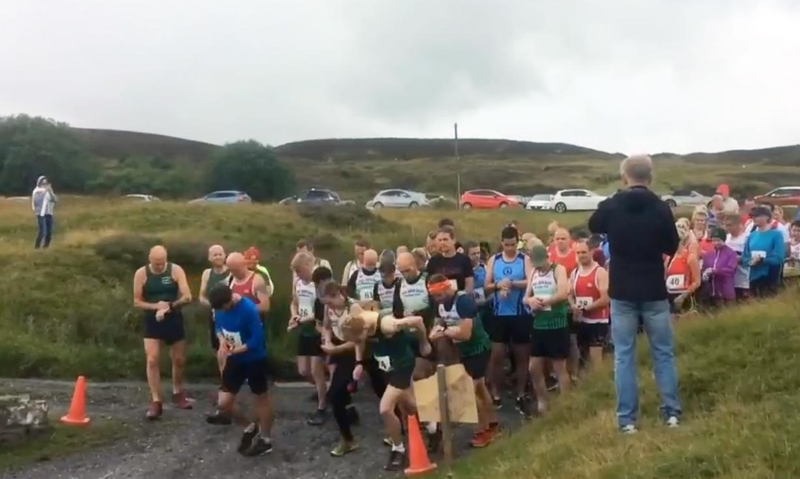 Jamie Parry was the first Green Vest (3rd Male and 3rd overall) across the line followed by Lauren Cooper (1st Female and 6th overall) and Simon Lewis (8th overall). Skipper Damian Williams was 3rd male, although Michael Cope did finish ahead of him but he was running in a Mynydd Du vest (I’m not getting involved in that discussion!). 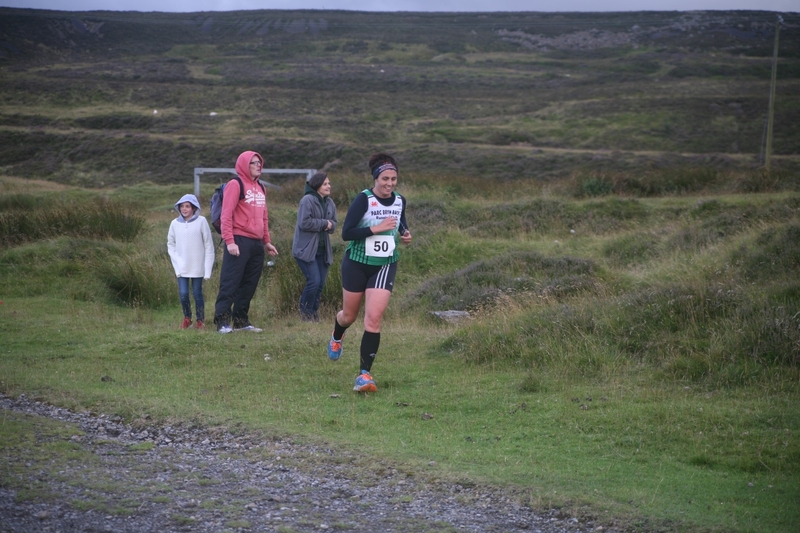 Julie Cashell took the prize for 2nd Female. We took a few age categories including MV50 (Simon Lewis) and 1st MV60 (Dai Smout running in a Mynydd Du vest). In addition to those, we also had a clean sweep in the team prizes with Jamie Parry, Simon Lewis and Damian Williams taking the title for the men and Lauren Cooper, Julie Cashell and Sharon Newell for the women. Thanks to everyone for supporting Phillip Miles’s race and for those new members that chose this as their first trail race. Sam Jackson, Richard Price, Mike Matthews and Mathew Ellis participated in the third Parc Bryn Bach – Aquathlon Series on Thursday. PBB celebrated it’s 250th parkrun with a special visit from the legendary Steve Jones. His sister Kath Jervis also celebrated her 100th time volunteering at PBB parkrun. In addition she has also run it 121 times so has only missed 29 of the 250! Club members also celebrated with some PBs. Tony and Rachel Lewis were on tour at Richmond Park in London. Not sure if they encountered any of the famous deer along the route. The ever adventurous Sam Standerwick participated in the Dorset Invader Trail Marathon organised by her favourite race organiser White Star Running. I’ve never run a race organised by them but have heard nothing but good things. Prior to the race Sam was expecting 27 miles and 2,200ft of ascent but it transpired that the total distance was 28.9 miles and 3,100ft of ascent! That’s some tough going. The terrain proved tricky too but Sam was only 20 minutes off her original target. And if that wasn’t enough, Sam went on the hunt for more bling!As if 28.9 wasn’t enough in a day, I’ve just done the Chaos Charity race which was basically 1.5 miles following a pickup truck with a bloke dressed as Caeser shouting commands (star jumps, sprint, press-up etc). All for a good cause though and bonus of more bling! Unfortunately Kim wasn’t feeling great so the so cake run didn’t feature any of her cakes but the show went on, albeit with a few less runners. They still had a good run with plenty of hills. Suzi Tew and Alison Holton continued their training with a 13.1 mile run around Abergavenny and the Heads of the Valley. Mike Williams took Kathryn Price, Darren Swift, Ruth Butterfield, Darren Kippest, Stephen Carter et al on a 13 miler. Well done to Caroline Matthews (she’s becoming a regular feature on the Weekly Roundup!) on completing a 10 mile run! And in true runner style she cracked open the Jaffa Cakes to replace all those calories. The Hamers, Gary Bartram, Andrew Meadows and Jamie Parry ran the Tenby 10K on Sunday. Jamie Parry finished 5th in a time of 37:33 and Andrew Meadows also secured a PB in a time of 50:09. A number of members attended the Leadership in Running Fitness course on Sunday. This was funded by the money we received from the Tesco grant. Thanks to all that visited the stores to get those little blue tokens! 10 members successfully completed the course so we now have a total of 22 qualified leaders who will help ensure that each training session will be both enjoyable and most importantly, safe. No Replies to "Weekly Roundup, July 24th – July 30th"